Weapon select menu functional but still in the early stages. 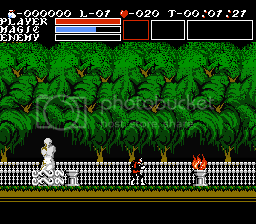 Also testing to see how the Main Hall graphics from Vampire Killer look in an NES game. Last view: 2286 days Impressive! I guess all you need to do is display the name of the items being chosen. That's pretty simple, though. The MSX graphics aren't really very consistent in quality. Some look great, some are kinda meh. The Main Hall graphics are one of those that are kinda meh. The Entrance Courtyard is definitely superior. Last view: 56 days hmm, I am probably not going to display the name of each weapon. I am thinking of doing something similar to that and that is displaying the name of the enemy you are attacking and their hitpoints remaining where it normally says "ENEMY"
Koala, you mentioned before about working on level layouts. Do you have custom graphics to go along with those? If I could see them I might want to plug them in to see how they look. Last view: 2286 days I do have some custom graphics from a partial hack I did ages ago. I'll see what I can dig up but, I can even make some new ones if you want. God I want to play this game so bad. It's amazing is that this is still 8 Eyes, right? It looks like you have an excellent command of sprites and how they are programmed more than anything, and I really like the application here- the little boat, the wing, the dracula fang ball- looks like part of a whole new mode of gameplay in the works without being obnoxiously overgimmicky. Have you done work on enemies yet? Thanks, I'm glad you dig the game. Yes it is still 8-eyes, however the only thing you will recognize from 8-eyes now is going to be the crappy sound and music. I haven't yet tried to improve that yet. None of the enemy AI has changed. 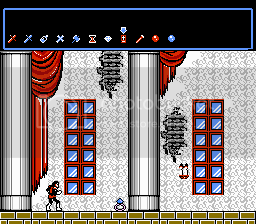 The enemy sprites were redrawn into Castlevania enemies by Ms. Clawful.. which looks beautiful... but I am going to have to re-program the enemies from scratch in order to do things like day-night mutations, gravestone spawning, and NPCs. I am finished with Simon's controls and abilities, and done just about all the items and power-ups. Next I am moving toward environment interactions such as water, lava, spikes, and.... I think I want to have medusa's turn you to stone. You'll be able to use SRAM/EXRAM to save games. How about that.. The save screen is a mess, so no preview of that. You may also use passwords as an alternative. Any idea if this hack will run on actual NES hardware? Last view: 219 days @amarcum81: I own a PowerPak (NES flash cart), so i tested it on NES hardware myself. It does work.I live in Europe, so the test was on a PAL NES unit. If it will run glitch-free on an American unit, i am not sure. @amarcum81: I own a PowerPak (NES flash cart), so i tested it on NES hardware myself. It does work.I live in Europe, so the test was on a PAL NES unit. Thanks Matrixz, I'm going to have it dumped on a cart when it's released, that's why I was asking. It just feels better playing a great hack like yours on actual hardware. It's almost done - at least as done as it will be. It can only be put off for so long. 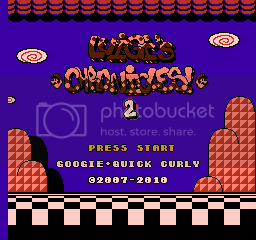 Last view: 74 days @Quick Curly Cool! I miss playing SMB3 hacks anyway so I can only play romhacks. Series of screenshots showing off progress of my new hilly tileset for my Reuben SMB3 hack. What original SMB3 hilly (or underground) level would you guys like to see remade with these graphics? Any thoughts on the graphics themselves? Might look familiar if you've played Days of Ruin. And some customised missile silos. Last view: 1266 days I actually had the code for the stats done for ages, but I only just wrote some code to actually display it. MySQL - queries: 122, rows: 163/0, time: 0.086 seconds.